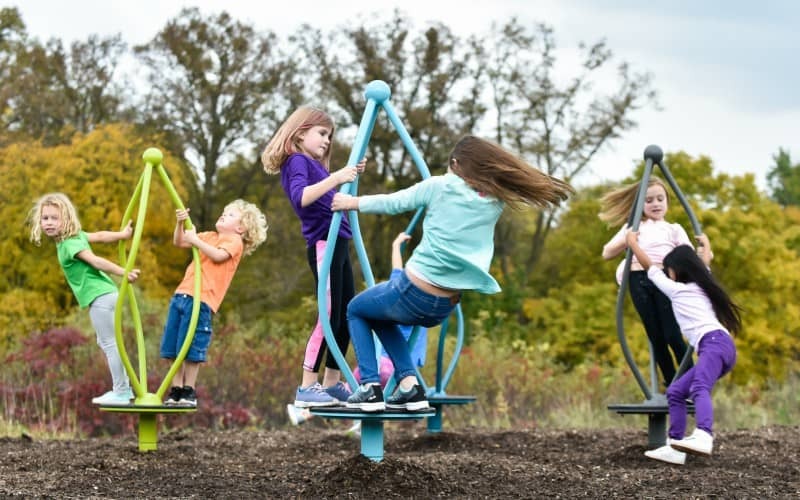 Rhapsody™ outdoor musical play instruments by Landscape Structures are the perfect addition to public playgrounds, child care centers, community centers, schools, senior centers and other public spaces. This multi-generational activity encourages people of all ages and abilities to share their musical creativity, knowledge and joy with one another. Grab a mallet and experience all 15 lush notes of this captivating instrument. Flat bars make up the 15 major notes on this instrument, but the sound of each still resounds. Players can soar two full octaves across this extravagant instrument, striking rich tones in major key. These junior sized drums: Kettle Junior, Kundu Junior and Goblet Junior are just the right height for early drummers. Eight brilliant notes ring out from this junior sized instrument. Preschoolers can play their way along one full octave of this richly toned instrument. Children will enjoy making up their own tunes with eight major notes these flat bars make. 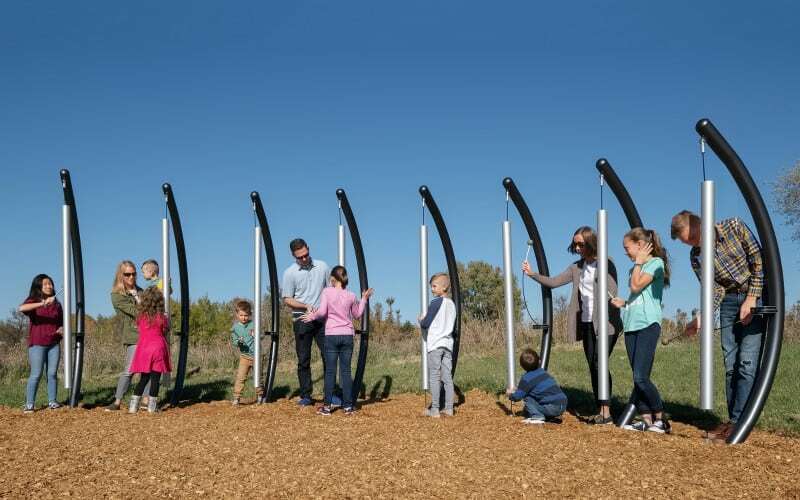 Unlike your orchestra or band class, there’s no such thing as a wrong note with Landscape Structures’ Rhapsody Outdoor Musical Play Instruments. Children— young and old—can step up to an instrument they’ve never played before and be able to make beautiful, rhythmic, melodic music right away. Making music simple and readily available to young children can help develop their interest in pursuing music in more traditional ways. Rhapsody Instruments offer a full, sensory play experience. While engaging the senses, the instruments provide a chance for all children to express their individuality and interact with others through spontaneous creative expression. The outdoor musical play instruments also are beneficial for children with special needs. Making music can provide them with a sense of autonomy that bolsters self-esteem, as well as stimulates development and enhances responsiveness to their environment. All LSI Rhapsody instruments are wheelchair accessible. The instruments can withstand the rigorous play of children and the extreme elements of nature and vandals. Music by its very nature is universal. Rhapsody instruments are beautiful instruments that focus on social sustainability for public spaces that include an aging population and a consumer-oriented and increasingly diverse culture. They also meet the need for doing more with less. Embracing the concept of Universal Design, the rhapsody line goes a step beyond Accessible Design to create environments that are usable by all people. While they are accessible for people with disabilities, these instruments enhance any outdoor setting making it usable and appealing to all. These outdoor musical play instruments ensure musical success from the very first note. The ensemble is created so any combination of notes is pleasing. Internationally recognized as the finest and most innovative musical ensemble, Rhapsody sounds are sophisticated and surprisingly delightful. Rhapsody outdoor musical play instruments offer a unique play experience connecting people to their creativity in outdoor environments. Landscape Structures offers beautiful instruments that enliven outdoor settings. Engaging and inviting participation and interaction, Rhapsody bring people back again and again. Rhapsody instruments are easily played by people regardless of age, gender, ethnicity, mobility, visual, auditory or mental ability. Music will always be a gathering force that builds community. These unique sound sculptures deliver creative sensory play through engaging interactive art. The next generation of outdoor musical instruments Rhapsody delivers concert quality sound. 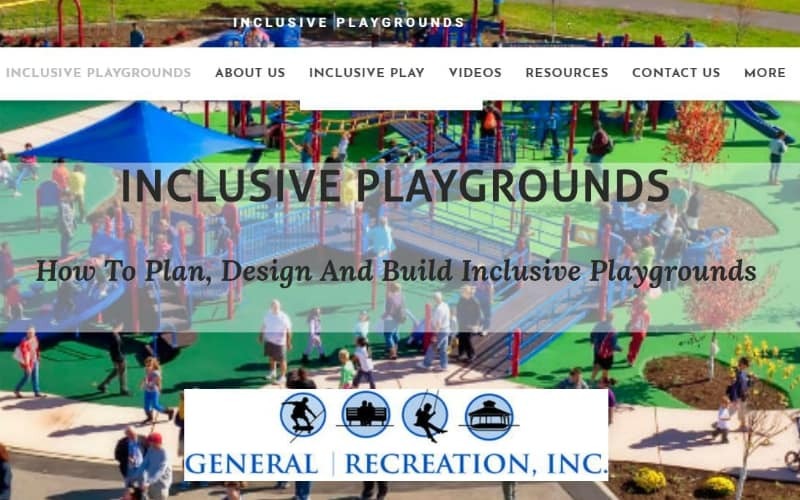 Landscape Structures makes an ensemble of outdoor musical play instruments that everyone can play making them the ideal universal design element. With Rhapsody, musical expression is accessible to everyone regardless of musical training. Any grouping of these real musical instruments plays together in perfect harmony making them fun and engaging for the novice or expert alike. Rhapsody is a musical ensemble of real instruments with distinct pure tones that blend into soothing sounds. These percussion instruments are perfectly tuned and make musical expression accessible to everyone, regardless of musical training. All Rhapsody instruments are in the category of percussion instruments because they are played with mallets or your hands. The ensemble is created so all instruments play together and any combination of notes is pleasing. Each instrument has a different combination of a notes that work together creating harmonious and complementary notes. The simplified tonal system is what allows for untrained musicians to improvise beautiful music, played totally by ear. Rhapsody instruments are easy to play. Hand-eye coordination either comes naturally or is easily developed for people of all ages. Each instrument has a unique mallet that is designed to produce the fullest sound. The instruments are placed at an optimum angle for maximum ease of play by children, adults, elders, and people with physical and cognitive challenges. Rhapsody musical instruments come in assorted shapes and sizes and are made from different forms of materials in order to achieve the variety of tones. Tones sustain for five seconds or longer so players can hear the harmonies that are created. As different notes are struck, layers of soothing sounds linger that are sophisticated and surprisingly delightful. They are just fun and easy to play. The instant gratification and total success that is achieved by playing music builds self confidence that spills over to many other areas of life. Creating beautiful music is not reserved for highly trained musicians. With regular use, these instruments retain “like new” condition and the sounding elements never go out of tune. Additionally, the materials and construction methods are designed so the instruments sound good over a wide range of temperatures. Click Here to view Rhapsody instruments on Landscape Structures website.